Third spaces are swiftly becoming a norm, with research suggesting an undeniable correlation between collaboration and corporate success. Collective thinking provides a competitive edge that companies are striving to cultivate within the organization. A recent theme within the workplace is a shift from one-on-one meetings to impromptu & spontaneous interactions promoting fruitful conversations.. This inclination, requiring one to step out of their individual box, has led to a challenging and varied scope of work. The facility itself, and how it is furnished, encourages collaboration. Workspaces now require unrestricted and flexible office environments. Recent studies show that, when third spaces are available, employees use their workstations less and interact more. Unassigned workstations are being encouraged, so people can pick and choose how and where they want to work. The tendency is to make workspaces feel like home. An environment that is warm, friendly, encouraging and emphasizing the well-being of the occupants. Another research indicates that changing postures can be physically energizing and mentally stimulating. Each person’s well-being is of utmost importance and can be affected by simple changes in activity such as sitting and walking. Staying ahead of the curve, at RCA, we are constantly learning and abreast with the global trends in design and functionality within spaces. We create dynamic environments that promote people communication by incorporating agile living room concepts in the workspace. Work cafes are designed within workspaces that encourage the staff with freedom in how they want to work. 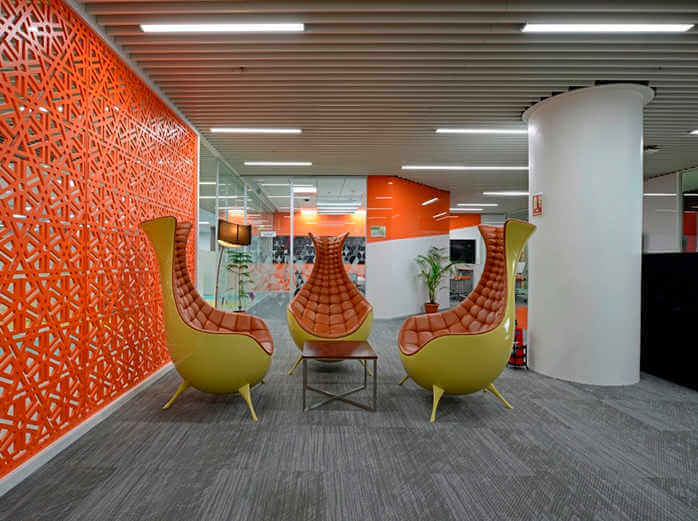 Varied textures, contrasting elements, and warm hues are integrated to generate a homely feel across the facility.